Chapel Hill, NC – As the Triangle’s largest green community, Briar Chapel has a very special connection to Earth Day. 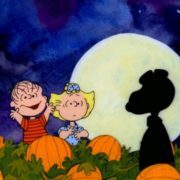 So it’s no surprise they have a full day celebration planned for this Saturday, April 21, 2012. I call it 9 Shades of Green. Briar Chapel’s first green event starts off with a 5K to support The Abundance Foundation. The 4th Annual Briar Chapel 5K Run will be chip timed, USAT&F certified and follows a scenic road course through the community. Pre-register to get a cool, moisture-wicking race t-shirt by TS Designs. Enjoy live music by Justin Johnson, post-race massages and local food and drink. You’ll also receive a ticket for a drink from Fullsteam Brewery or Carolina Brewery. The race begins at 9 am and ends with an award ceremony. Our second shade of green is discovering healthy and sustainable living with local vendors and workshops in Briar Commons Park from 3 pm to 6 pm. Find out how to shop for affordable organic produce explored by Linda Waston of Cook for Good and author of Wildly Affordable Organic. See a daring performance by BMX stunt crew, King BMX. And healthy living can be for your four-legged friends, as well! Bring your dog along for the fun – stop by Dogwood Veterinary Hospital and Pet Resort‘s tent for great information for fido. Representatives from YardSprout will show you how to create a functional container garden of your own. And Green Thumb Committee members will share information about the Briar Chapel Community Garden. Then tour all of Briar Chapel’s model homes and discover the sustainable innovations that make these homes healthier and more energy-efficient. The Hunt for Green QR Code, from 1 pm to 4 pm, is a fun scavenger hunt. 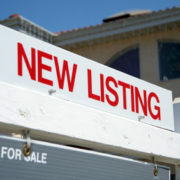 It’s an exciting way to learn all about the benefits of living in a green home in Briar Chapel. You’ll use your smart phone to scan QR codes and learn about green features through the community. Bring a digital camera so you can take pictures along the way. Then you’ll return to the information center to share your data and be entered to win a Rain barrel capturing system (a $100 value). What’s greener than shopping local? From 3 pm to 6 pm, celebrate and support the best of local businesses in Briar Commons Park including The Joyful Jewel, The Abundance Foundation, Piedmont Biofuels, Celebrity Dairy, Fearrington Artists, Edible Piedmont, Stone-Crow Pottery, Okfuskee Farm, Wellness of Chatham, Dogwood Veterinary Hospital and Pet Resort, Memory Movement, Silvan Essences, Healthy Mom Coaching, and Triangle Body Therapy. Plus enjoy a live concert by Lizzy Ross Band and Tom Maxwell. Then taste local eats at Chatham County’s first ever food truck rodeo. Ten percent of the proceeds from the food sales help benefit The Abundance Foundation. From 6 pm to 8 pm enjoy a viewing of Pixar’s Wall-E under the stars. 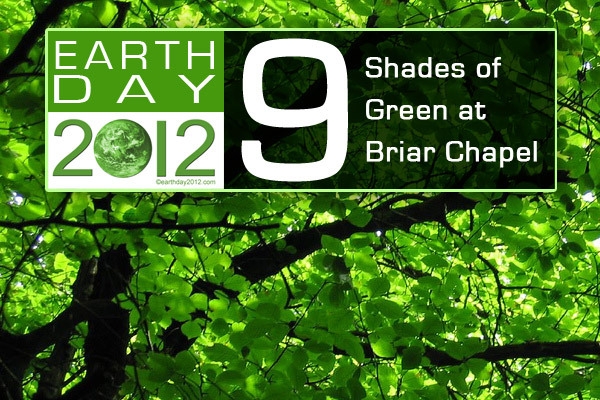 There you have it: 9 shades of green and an all day celebration of Earth Day at Briar Chapel, this Saturday April 21, 2012. What’s Your Favorite Earth Day Celebration? There’s lots of great stuff going on for Earth Day all over Chatham County and the Triangle. What’s your favorite celebration? Drop me a note or leave a comment.